To increase your knowledge obviously. Seriously, Office 365 is a very large surface for any technologist to cover. We use our experience, our contacts with Microsoft, and our connections within the industry to discover what’s really important about Office 365 and write it down. Unlike other technical books, we keep on refining that content as new information comes to hand. Office 365 for IT Pros is unique in that respect. You don’t just buy a book: you buy a living collection of knowledge. In fact, it’s rather like writing software: you look at code and decide that it can be written more concisely, better, or to give better performance. That’s the way we think about our text. Our approach seems popular with readers. We’ve posted a few comments from people who have bought and like Office 365 for IT Pros. If you need to be convinced about the volume of change that happens within Office 365, just browse our change log to discover the number and type of changes we make to the book content on an ongoing basis. Because we have a team of experts reviewing what Microsoft changes, we think we have a good chance of figuring out what’s important and what needs to be in the book, and that’s what we include. The Main Book is the one that we update most often. It’s about 1,080 pages long at this point. 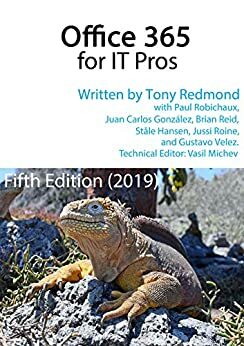 You can download an excerpt (chapter 1, the foreword, table of contents, and introduction here: Office 365 for IT Pros 5 – Sample Chapter). The Companion Volume contains lots of interesting information that we removed from the main book (to keep the page count down) or couldn’t find a good home for in the main book. It’s still valuable information to have, but we don’t update the companion volume as often as we do the main book. The companion book is about 270 pages long. The book isn’t available in print. We looked at creating a print version but it’s just too difficult and wouldn’t justify the effort – and there’s no way we could continue updating the content. Once ink hits paper, it stays there. EPUB (suitable for most eReaders). The Kindle version is bought from Amazon. You can buy the EPUB and PDF formats from Gumroad.com, an eCommerce platform based in San Francisco, California. When you buy a book, Gumroad sends you a receipt. The receipt contains a View product link. Click the link to access the book files. Some people have reported that their spam filters consider Gumroad email to be spam, so please check your junk email folders if you can’t find the receipt in your inbox. If you have problems or want the receipt to go to a different address than the one you used to set up your Gumroad account, send email to the Gumroad support team and the nice people there will help you. Your Gumroad account is from where you download updated files too. When we release an update, we send a message to our subscribers to tell you that updated files are available. The update messages go to the email address for your account. Log into your Gumroad account and using the link in the message or your original receipt and you can download the files. We can’t bundle books on Kindle, so the two volumes are available separately. Some people like to read the PDF version on Kindle (instructions here). We struggle with Amazon every time we release an update. The Kindle publishing model is built for novels, which hardly ever change, and doesn’t do well with large technical books that might have 20-50 separate changes in an update. We have to convince the Kindle team to notify purchasers that new content is available. Sometimes they accept that they should do this, sometimes they don’t. The older (fourth edition) book is still available on Amazon. We have left it there to allow subscribers to that edition to update their copy.